The Women’s International League for Peace and Freedom (WILPF) is an international, non-governmental organization (NGO) with National Sections covering every continent, an International Secretariat based in Geneva, and a New York office focused on the work of the United Nations (UN). Our approach is always non-violent, and we use existing international legal and political frameworks to achieve fundamental change in the way states conceptualize and address issues of gender, militarism, peace and security. Our strength lies in our ability to link the international and local levels. We are very proud to be one of the first organizations to gain consultative status (category B) with the United Nations, and the only women’s anti-war organization so recognized. Our history starts in 1915, when 1,200 women from a diversity of cultures and languages came together in The Hague during the First World War, to study, make known and eliminate the causes of war. At that time, as well as now, the purpose in founding WILPF was to have an organization through which women could work for peace and freedom by claiming women’s right and responsibility to participate in decision-making on all aspects of peace and security. Below you’ll find just a few of the ways in which WILPF has made progress as an organization and impacted on a global level. Almost as soon as it was created, WILPF’s values were hailed and adopted by some of the world’s most powerful leaders. WILPF’s International President Jane Addams was personally received by President Woodrow Wilson in Washington. WILPF’s beliefs provided President Wilson with nine of his famous Fourteen Points, the basis of a peace program that was used when Germany and her allies agreed to an armistice in November 1918. Not only do we take pride in being the oldest women’s peace organization in the world, we can also boast two Nobel Peace Prize winners within WILPF’s history. In 1931, Jane Addams, WILPF’s International President was awarded the prestigious prize for her peace-keeping efforts. Shortly after, in 1946, WILPF’s first International Secretary, Emily Greene Balch, was also presented with the award – an obvious acknowledgement of WILPF’s success in its endeavors. During its lifetime WILPF has organized dialogues between women in the Middle East, sent delegations of women to North and South Vietnam to oppose the Vietnam War, and worked closely with the UN to enact change for women’s peace and security. For the first time in Afghanistan, we are a number of women, men and youth come together with a commitment to work for a world where is no war, peace prevail for everyone and freedom for women alongside with our sisters in the Women’s International League for Peace and Freedom (WILPF) where many women and men made their strong commitment against war, injustice and have struggled to make the world destitute from weapon and war. 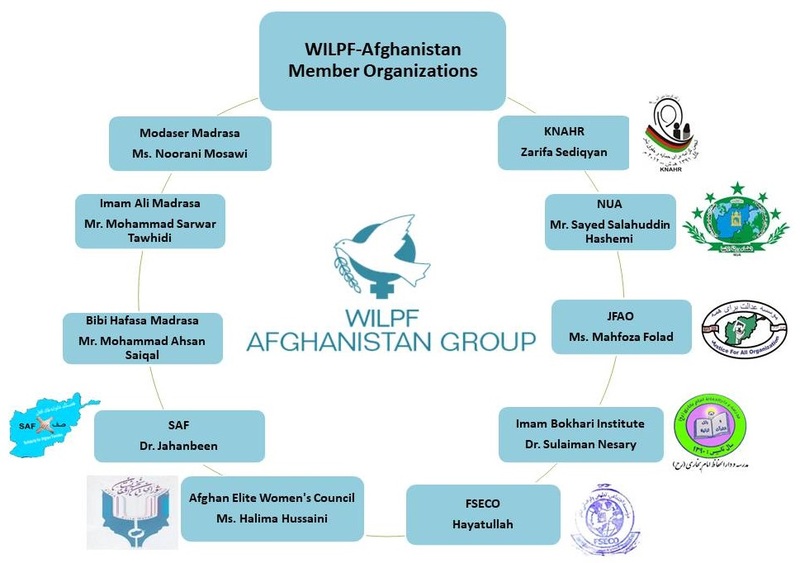 In May 2015 we had our first ever meeting to introduce WILPF, goal, mission and vision to some Afghan sisters who agreed to be part of this organization and work for its goal in Afghanistan. 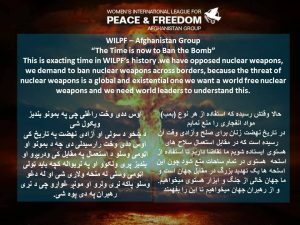 WILPF-Afghanistan group works for Afghanitan free of war and violence, where social justice and freedom for everyone is prevailed. 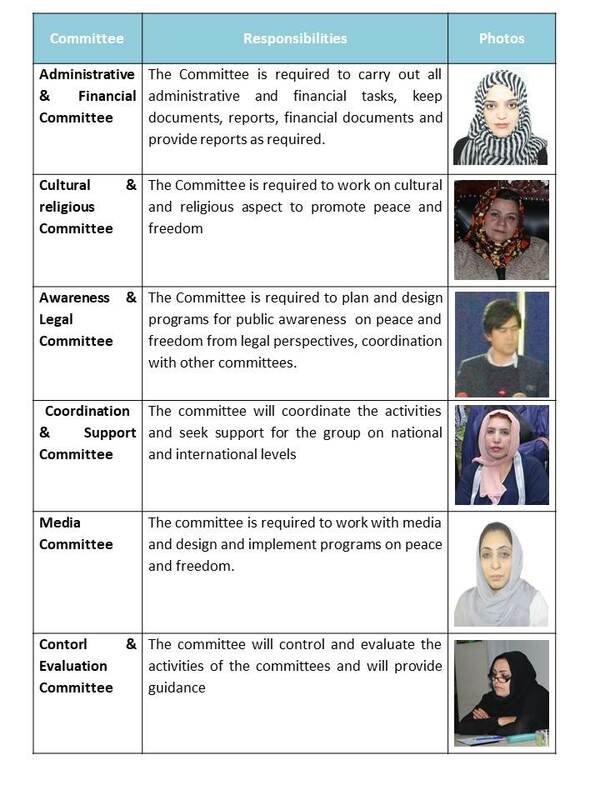 We aim to bring together women in Afghanistan as peace makers and enhance their role in the development, freedom and prosperity in order to be able to become active and constructive member of the global movement for peace and freedom (WILPF). 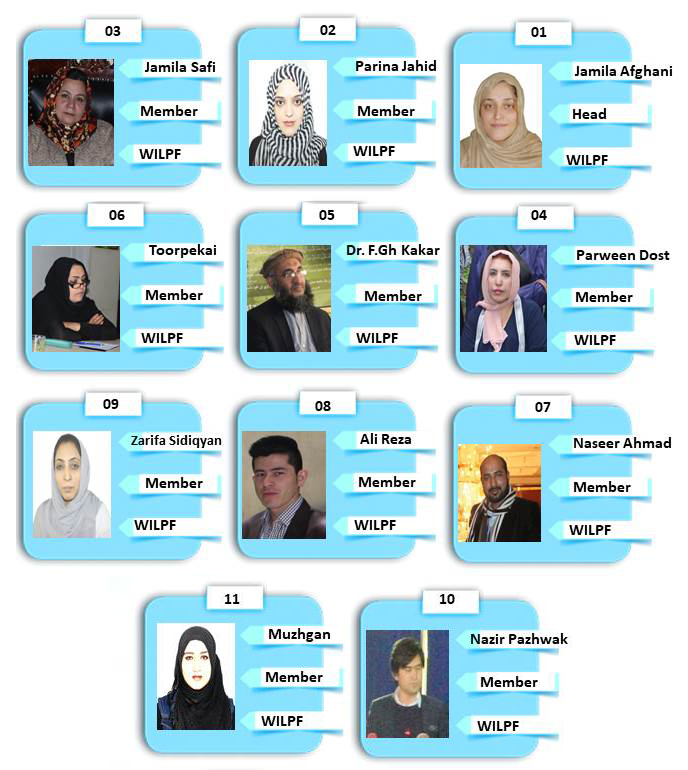 WILPF-Afghanistan is a group of volunteer women and organizations who are storngly commited and believe in common that there is urgent need for permanent peace in the country. We highly consider the 3 points below as we step our longstanding ambition. The world to be fair for all Human Being. Equal participation of people in decisions which affect their lives must be ensured. Any group, sect, faction of the societies must cooperate with each other for a just, peaceful and free world. Create and support various programs of peace for the survival of the communities and plan positive change (peace and freedom) considering lessons learned from the past for a better present and future. Share ideas, experiences and information with other like-minded institutions on national and international levels. Rooting out the violence existing in the communities against women, children, youth and men. through cultural, religious, social, politicl and economic initiatives. Establishing stronger relations and contacts on national and international levels for peace, social justice, democracy and freedom.